Authors: Allakhverdiyeva L.I., Sultanova N.G., Dzhafarova A.O. Aim. To study the state of the cytokine response in children with atopic bronchial asthma during pharmacological correction with vitamin D.
Methods. 63 children aged 3-17 years with atopic bronchial asthma of varying severity were examined. As a control group, 10 practically healthy children of the same age who had no history of allergic manifestations and no hereditary complications, were examined. The patients were divided into two groups matched by age: group 1 included 33 patients with mild (n=20) and moderate (n=13) bronchial asthma who received only basic anti-inflammatory therapy according to the severity of asthma; group 2 included 30 children with mild (n=18) and moderate (n=12) bronchial asthma who received basic anti-inflammatory therapy with vitamin D containing Tridrop [3 drops (1500 IU) per day for 1 month]. Patients were assessed for interleukin-2, -13 and -17 in the blood serum using a solid-phase enzyme-linked immunosorbent assay before and after treatment. Results. The results obtained made it possible to clarify the changes in the cytokine spectrum in patients with atopic bronchial asthma in the course of the disease and the effect of pharmacological correction with vitamin D on it. The mean level of interleukin-2 in group 1 remained practically unchanged, the value of this cytokine was 2.77±1.51 pg/ml (p >0.05). In group 2, the mean interleukin-2 level increased to 5.07±1.02 pg/ml (p <0.01). The mean level of interleukin-13 in group 1 patients increased but not significantly, but in group 2 a decrease of interleukin-13 to 11.3±3.8 pg/ml (p <0.05) was registered. Interleukin-17 decreased by 2.6 times in group 2 (4.8±1.6 pg/ml, p <0.01). In group 1 there was no significant change in the level of interleukin-17, in all children it remained elevated (p >0.05). Conclusion. Pharmacological correction with vitamin D on the background of basic anti-inflammatory therapy promotes the positive dynamics of the level of cytokines during the treatment of atopic bronchial asthma, which is related to the ability of vitamin D to regulate the function of Th2 and, as a result, to reduce the synthesis of interleukin-13 and -17, which participate in the pathogenesis of allergies and play an important protective role in bronchial asthma. bronchial asthma, children, vitamin D, cytokines. Global Strategy for Asthma Management and Prevention. Global Initiative for Asthma (GINA). 2016. http://:www.ginasthma.com (access date: 14.09.2018). Wood A.M., Bassford C., Webster D. Vita­min D-binding protein contributes to COPD by activation of alveolar macrophages. Thorax. 2011; 66 (3): 205–210. doi: 10.1136/thx.2010.140921. 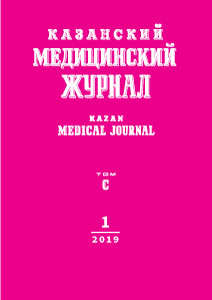 © 2019 Allakhverdiyeva L.I., Sultanova N.G., Dzhafarova A.O.